Berwick mum Michelle Jankovic has her hands full. 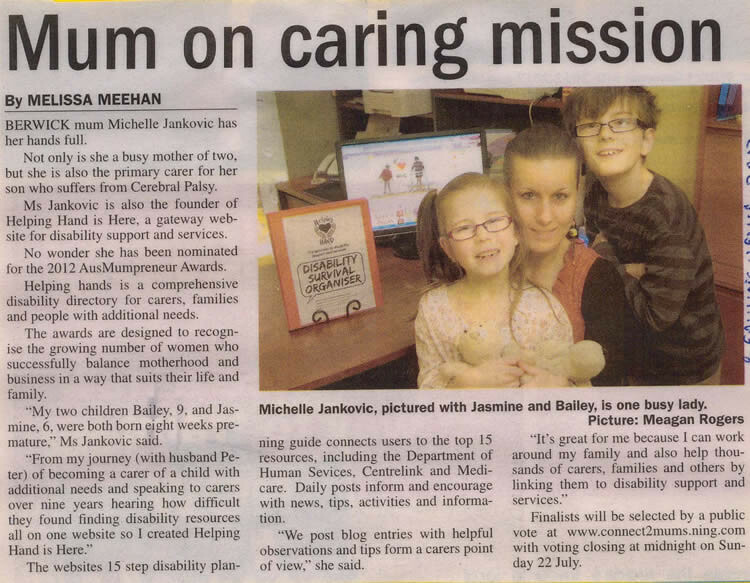 Not only is she a busy mother of two, but she is also the primary carer for her son who suffers from Cerebral Palsy. Ms Jankovic is also the founder of Helping Hand Is Here, a gateway website for disability support and services. No wonder she has been nominated for the 2012 AusMumpreneur Awards. Helping Hands is a comprehensive disability directory for carers, families and people with additional needs. The awards are designed to recognise the growing number of women who successfully balance motherhood and business in a way that suits their life and family. “My two children Bailey, 9, and Jasmine, 6, were both born eight weeks premature,” Ms Jankovic said. The websites 15 step disability planning guide connects users to the top 15 resources, including the Department of Human Services, Centrelink and Medicare. Daily posts inform and encourage with news, tips, activities and information. “We post blog entries with helpful observations and tips from a carers point of view,” she said. Finalists will be selected by a public vote at connect2mumscommunity.com.au with voting closing at midnight on Sunday 22 July.